This beautiful Crystal Encrusted Teddy Bear Pendant is a stunning signature piece. The pen.. The Beautiful Crystal Halo Pendant Made with Crystals from Swarovski® is rhodium plated & benefi.. 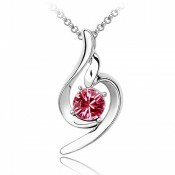 This beautiful Crystal Heart Tear Drop Pendant is the perfect accessory for any occasion. The c.. This Beautiful Crystal Blue Pendant is Rhodium plated, in a Light Blue Pear Cut Simulated Sapph.. This stunning Crystal Snowflake Pendant Made with Crystals from Swarovski® is a beautiful piece.. The Beautiful Crystal Solitaire Flower Pendant Made with Crystals from Swarovski® is rhodium plated .. This beautiful Crystal Square V Set Pendant is the perfect accessory for any occasion. The comp.. This beautiful Crystal V Drop Pendant is the perfect accessory for any occasion. The complete P..
Our In-House designed Diamond Pendant is made from a Natural Diamond and a Freshwater Pearl totallin.. This beautiful Enchanted Rose Crystal Pendant comes with a gold tone finish and comes in its very ow.. This beautiful Enchanted Rose Pendant comes with a vintage tone finish and comes in its very own lux.. This Stunning Flower Pendant brings you right into spring with its circular acrylic clear resin.. Inspired Necklace featuring a Snitch design. Comes with a long chain approximately 45cm. Comes in ei.. This beautiful Green Crystal Pendant comes with a halo of clear surrounding crystals perfect to..